When starting any new business, you need a detailed business plan. When I started herb/o/logy’s business plan, I was intrigued by the charitable community outreach page. After much thought, I decided that it would be a first-year priority that we find a beneficiary organization that would align with herb/o/logy’s beliefs. Around that same time, I met some soon-to-be friends who believed in organic gardening and a natural lifestyle – a lifestyle that included three huskies, a cat, and a new Siberian Husky rescue. Early in herb/o/logy’s planning, I wanted to include a canine line. A line that would use natural alternatives to bathing, and promote an overall spoiling of our canine kids. We are honored to have the herb/o/logy Canine Companions line. This line includes: Indulgence soap, Smokey’s Date Night Spray, Romeo’s Mousse, and Yahtzee’s Wheel Dog Wax! All of the products are named after dogs from Raven’s Husky Haven and Rescue. 100% of the proceeds from the canine line will go to RHHR to help huskies in need! When you first start a business you look to your family and friends to help and support you. I have heard conflicting stories as to whether this works or not. In herb/o/logy’s case that’s a resounding yes! Not only are they the biggest supporters but the most loyal of customers. I am blessed with such an awesome supportive group. The herb/o/logy family has grown from its grass roots to become small army. 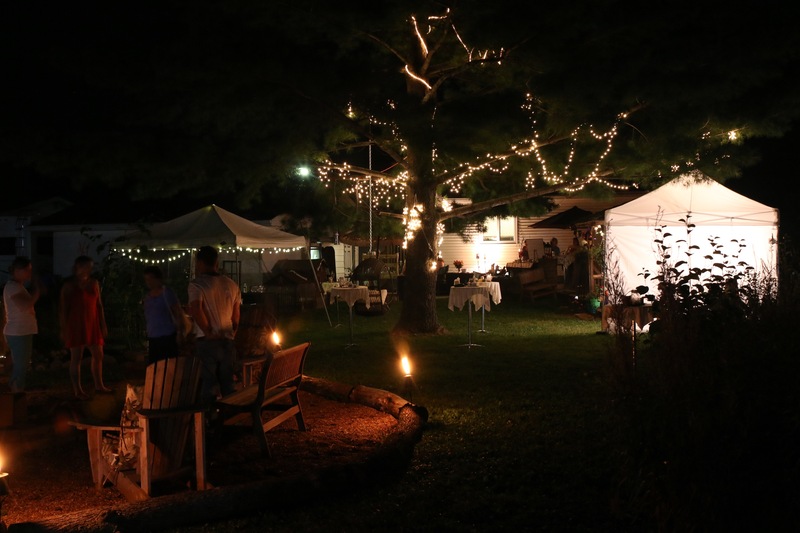 The herb/o/logy garden party was was held last weekend. We opened our organic gardens and welcomed our customers, with wine and appetizers. Included in the evenings entertainment was the herb/o/logy’s soaps displayed throughout the garden. 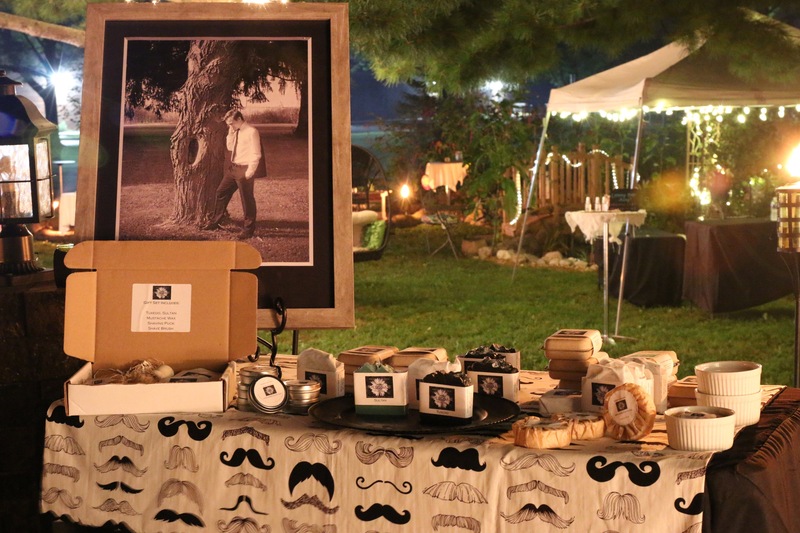 That night we launched the herb/o/logy’s skin care for Men in honor of my two sons, Josh – Grit, Will – Debonair. This was met with applause and was a resounding success. My sons were initially shy when they came out holding their respective gift boxes, but warmed up immediately, upon seeing friends and family. Instead of asking for the Grit or Debonair gift box they asked for Will’s box or Josh’s box! That’s what makes the herb/o/logy customer family! Thank you herb/o/logy family present and future! The next step in herb/o/logy’s evolution was to add a men’s line. We decided to have two separate men’s lines in honor of my two boys. My children are polar opposites in everything! The older one has always been stoic, straight forward and a hard worker. I remember when he could barley walk, I came into the living room to find my alarm clock completely taken apart. Of course I didn’t find humor in it then but I do now! He always wanted to know how everything worked! My younger son is very different he is more of a thinker and always has been a little sponge. He likes all things name brand and likes to look good! Even going to work, he always takes a shower first ( he works in a dog rescue). When he was little I took him shopping for a new outfit to wear out to dinner with my parents. We went into the dressing room to try on his little pants and shirt. He then hands out the shirt and says ” it’s the wrong blue mom!” Well that got the entire dressing room laughing. So it only made sense to launch two different men’s line one for each boy. Grit is for the hard working man not afraid to get his hands dirty. He is sweet, loving and always willing to lend a hand to someone in need. With those traits in mind we came up with several products. Mariner is a tough grease buster for your hands made with organic coconut oil and brine solution reminiscent of the sea. Steel is made with cocoa butter and goats milk to help nourish your skin from a hard days work. Grit also includes a degreaser hand cleaner (Walnut Workman), herb/o/logy style. Debonair is for the sophisticated man, possessing natural iconic elegance – and who likes to look good no matter what the occasion. He is intelligent, forward thinking with a caring global vibe.We developed some high end soaps with his personality in mind. Tuxedo is for a night out on the town, it’s elegant high gloss exterior paired with a warm notes with a hint of leather, no after shave is required for this experience. Sultan with it’s exotic scent and granite look is sure to please the sharpest dressed man. We added some mustache wax to finish up the look for the night out on the town. For both lines we have included a shave experience that cannot be beat! We have made some moisturizing shaving pucks for that old fashion shave experience which will leaves your skin smooth and moisturized. Which man are you? I’ll bet your a little of both!